Shaun Briscoe has been encouraged by the start that Widnes Vikings have made to the Super League season, despite injuries robbing them of key players. without high-profile winter signings Kevin Brown and Gareth Hock. Full-back Briscoe told BBC Radio Merseyside: "It shows we've got strength in depth and we've still got other players to come back as well." 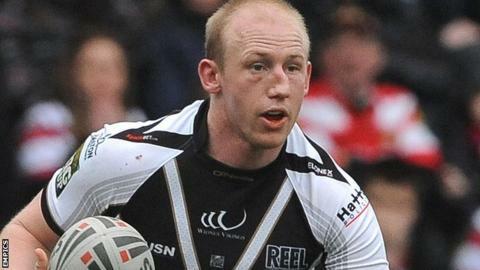 Widnes host rivals St Helens in their first home game of 2013 on Sunday. England international Briscoe was included in Widnes's 19-man party for the game at the Twickenham Stoop but missed out on a place in the matchday squad. His time with the Vikings has been disrupted by a number of injury problems, which he is hoping to put behind him in 2013. He continued: "We've got a lot of competition for places and that's a big thing for us. I was really disappointed to miss out at the weekend and Rhys Hanbury did a great job at full-back. "I'm itching to get back. I busted a gut in pre-season to get right for round one [after surgery] but it was probably a little bit too soon for me. It was a case of learning from last year's mistakes of coming back too soon. "It was great to be out there just as the water carrier, but I'm not a good watcher. The fans didn't see much of me last season and that's something I want to put right this year." Meanwhile, chief executive James Rule is hopeful that Widnes' bright start to the season will result in a large crowd at the Stobart Stadium for Sunday's local derby against Saints. Rule said: "We've worked in the off-season - we've put a huge amount of resources into our community programme and worked hard to make it affordable and accessible for everyone to come and enjoy this game. "It's an enormous occasion for both sets of fans, judging by the ticket sales at both clubs. Saints will be coming in good numbers and I'm sure our fans will want to meet that challenge."